In the first months of this blog, I wrote a series of articles on the stabilization wedges theory by Robert Socolow and Stephen Pacala, professors at Princeton. This theory brings 15 ways to decrease our carbon dioxide emissions. This is an interesting way to discover the main possibilities to mitigate climate change. From energy efficiency to renewables and from carbon capture and storage to afforestation, they are (almost) all here. To learn out more, please check out my introduction, the details & comments and finally my choice of stabilization wedges. I look forward to reading your comments and choices of wedges. I don’t find it a very inspiring approach, for two reasons. Firstly, it requires a co-ordinated global approach. Experience shows it’s hard enough just to get a federal government with a set of coherent policies towards the same goal, let alone international. You have to include the very human Muddle Along Factor. Secondly, it takes no account of development of the Third World. Don’t they get heating, cooling, and powered transport? Are 2 billion Asians and Africans to be stuck in slums forever? Or will they develop? If they develop, will it be sustainably, or will we need another six wedges to balance out their development, too? This really is a problem with many environmentalists’ dreams, they think just of taking the Western world and slotting in efficiency and some solar panels, there’s no thought of development of impoverised countries. And the truth is that we must be both resource renewable and socially renewable, too. Otherwise we end up with my personal dystopia, ecotopia gated communities with electric, organic biodynamic and solar everything surrounded by slums of dark-skinned slaves to the ecotopians. Hello Kiashu and thanks for your comment. I didn’t say it was perfect. I don’t know if you read my articles but I brought some strong arguments on why it isn’t enough. I don’t agree with your views nonetheless as most wedges are dedicated directly to “developing” countries. 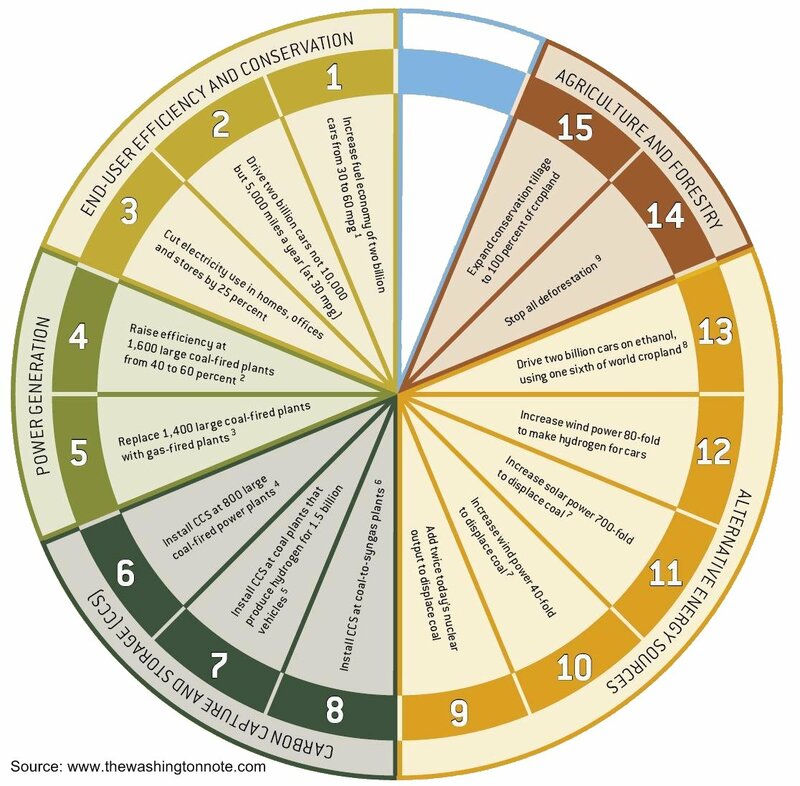 The stabilisation pie chart presents only two things relevant to developing countries – conservation tillage and stopping deforestation. For the rest, they speak for example of increasing renewables to displace coal – they don’t speak of adding new generation capacity to developing countries. Whenever I hear talk of “wedges” like this, I think of a time when I worked at a buffet restaurant. We had several cakes out, all sliced into 12. The women tended to come along and cut a slice in half – since half a slice has half the calories, right? – though they’d take three or four half-slices. Then the next woman would slice that half-slice into half, and so on. Eventually we were left with 6 full slices sitting there amidst a pile of crumbs of the rest, and nobody would touch the full slices because the crumbs made them look bad. We had to take the plate back into the kitchen, put the intact slices on a new plate and send it out again. I imagine the “stabilisation cake” the same way. People will be reluctant to take any single full wedge, they’ll cut up multiple wedges into ineffectual crumbs.